Login, create account, forgot password, spam protection. 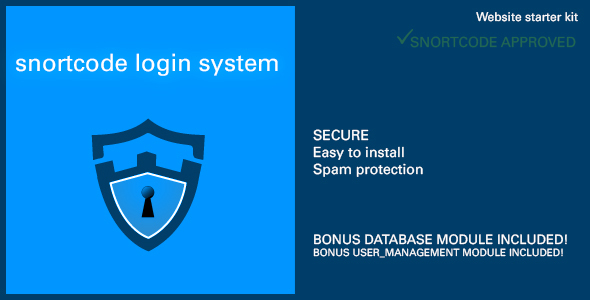 The SnortCode login system is developed using object oriented programming to minify redundant code and contribute toward future development on your web applications. BONUS* database module included with this package. We have spent a lot of time developing our MYSQL interaction _database module and can guarantee you 100% SQL injection protection. Our login system is mobile enabled & data conservative. SnortCode LS is extremely fast and reliable, i use it as a standard for developing all of my web apps now. Find a bug get 50% refund back & free technical support.